Is it safe to say that we have seen the back of winter? 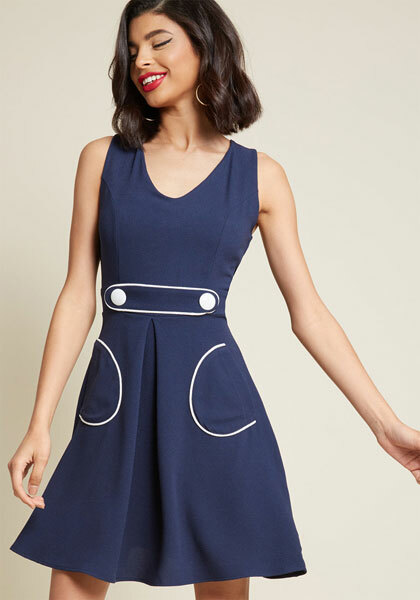 I hope so, not least because the summer wardrobe can be dusted off or added to with something like this Smak Parlour retro A-line dress at Modcloth. A new arrival at Modcloth, this is the ideal for those warm summer evenings out on the town or a nice addition to the suitcase if you are planning a trip to somewhere with heat this summer. The vintage cut of the dress will obviously catch the eye, but what really makes this one stand out are those 1960s-inspired details. 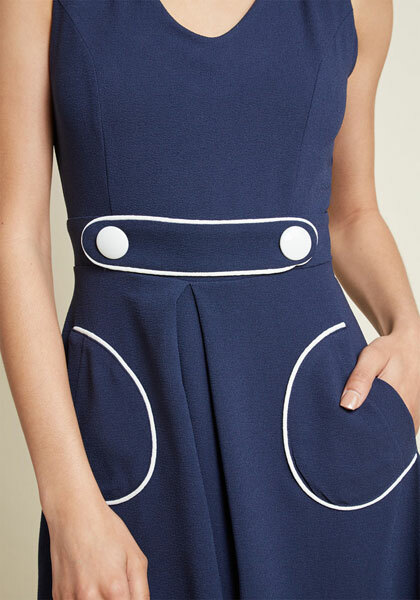 By that, I mean the white pumping against the navy blue dress, which is on the slant pockets and the buttoned waistline. If you need a dose of 1960s in your life, you can get this in sizes from XS through to XL. The price is the same for all at $69 and note that Modcloth does ship worldwide.